Explore music, culture while embracing creativity through improvisational solo or group play with the five piece Premium Ensemble. Perfect for anyone regardless of musical training, age or ability. These eye-catching interactive sculptures of art are engineered so that every note produced always blends into a smooth	symphony of sounds. 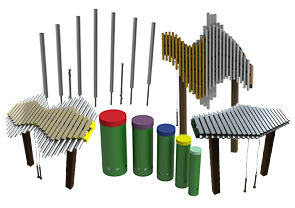 This comprehensive collection of public use instruments is designed for standout form and function—with a specific emphasis on	inclusion. Each instrument can be shared by two people at the same time, with leeway for up to 10 for the whole ensemble. Built with commercial grade materials ready for outdoor conditions and rigorous use. Tuned Drums are available in 'Adult' and 'Toddler' finish heights. All 5 drums come standard with green barrels with choice of cap colors as shown. For best results of Contrabass Chimes installation is suggested that 18" spacing is needed between chimes and 11" spacing in between mallet poles and chimes. 2 sets, 4 total mallets come standard included attached to the 2 mallet poles via nylon coated steel cables.